Ask Gary: Can the Lightning hold onto Cooper? 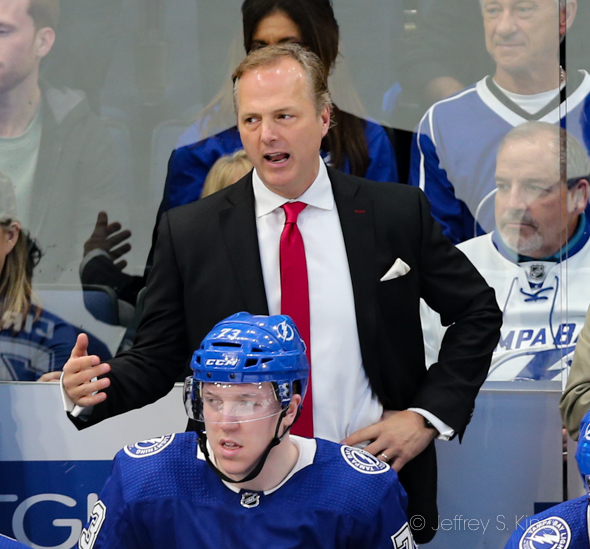 Jon Cooper’s contract expires at the end of this season when he will become a free agent. Ironically, the same situation occurred last year with the Capitals coach (Barry Trotz) who moved on after winning the Stanley Cup. Will history repeat itself? Does Cooper want to test free agency? What is the likelihood he re-signs with the Lightning? Larry, let's start with your most important question: What is the likelihood that he re-signs with the Lightning. I'd put that in the 90 percentile. Lightning owner Jeff Vinik doesn't lose many of his stars -- and yes, Cooper is a star -- along the way. I know that there has been some frustration that the Bolts keep getting to conference finals without bringing home the Cup. If you look at the other franchises in town, however, there is a lesson here. The Bucs got tired of Tony Dungy and -- after one magnificent year -- have faded away. The Rays got tired of Joe Maddon's plateau, and they haven't been back to the playoffs. So you blow things up at your own risk. Having the most impressive season in franchise history -- even if they don't win the Cup -- is pretty good. I think Cooper wants to be back. He loves this team, and why wouldn't he? It's built to compete with the upper echelon in the league. He's got a great farm system. Why would he leave? Well, there is money. Supposedly, Cooper makes about $2.25 million per season. Some coaches (Mike Babcock) are in the sixes. Then there is a new general manager. Might Julien BriseBois want his own guy? Maybe, but not with a team that is knocking at the door. If the core of the Bolts was going to be different next season, then maybe. But the last thing you want to do is spoil things, right? There was a report out of sportsnet.ca (Canada) at the first of the year that suggested the team was getting close. After Cooper reached 300 wins (in the second fewest games in history), I think he deserves a nice bump. How can things get messed up from here? Someone can value money over chemistry, and the other side can get angry. That's led to some breakups in sports. Personally, I expect Cooper will be back, and we'll be glad to see him. Who is more important to a MLB team — an everyday position player or a starting pitcher? That's an age-old question, isn't it, Scott. And the evasive way to answer it is to say that it matters who the player is and who the pitcher is. If the player is Mike Trout, and the pitcher is Sergio Romo, then I'm going to go with Trout. But if the two players are of equal impact, then you've got a debate. After all, a pitcher throws only every five days, while a hitter bats only one-ninth of the time. They both have their limits, don't they? If all things are equal, I"m going to go with the everyday player. An every day star can help a team on offense, on defense, on the bases, in the clubhouse. Four out of five days, a pitcher watches. Baseballjudgement.com did a comparison of the two weapons. It made a great point that a lot of pitchers don't go more than six innings anymore. That's six innings out of 45 in a five-day span. It just isn't enough work to justify the salaries, is it? Again, most teams have some of both. You need to have a big stick come up in the eighth inning of a tie game. And you need a shutout pitcher to squeeze the hope out of an opposing lineup. Me? I'm going to go with the thumper...barely. Agree? The Snell contract came together very quickly. Do you think the Rays were stung by the criticism they had received for giving him just a $15,000 raise? Jim, by this point, I suspect the Rays are fairly criticism-proof. Do you really think this team -- of all teams -- would spend 50 million dollars to avoid being criticized? Heck, fans have criticized the Rays even when they were going to playoffs. Here's what I think happened. The Rays decided that Snell is going to be good from now on, and they bought out all but one year of arbitration and his first year of free agency. At the going rate, if Snell remains one of the top pitchers in the league, that contract will be a bargain at $12.5 in four years. At age 30, Snell will be a free agent. And for the record, David Price started to earn $30 million a year from the Red Sox at age 30. The Rays are numbers-crunchers, Jim, if nothing else. They believe in buying low and selling high. Remember, they gave Brandon Lowe $49 million for eight years this week. It merely means the font office is gambling on paying now rather than paying later. I really don't think that criticism has much to do with it. There is also this. When the Rays gave Snell only a $15,000 raise earlier, there was a warning shot fired. Snell talked of his disappointment, and the last thing you want is for your ace to go into a funk. This way, the team protects itself from what Snell's contract would have been and keeps him focused. Think about this for a minute. Chris Sale, who finished behind Snell in the Cy Young voting this year, has agreed to a five-year $145 million extension. The Rays open their 2019 season this week. What are your top five questions going into the season? Paul, you can have questions at every position, through the starting rotation and through the bullpen. Baseball is a special events class where the information keeps getting updated. No one is a lock to be successful again. The game is too hard. 1. Charlie Morton: Will he stay healthy enough to eat up the innings that the team needs him to. If he can team with Blake Snell to be a 1-2 punch, this could be a nice ride. 2. Joey Wendle: He was one of everyone's favorite players last year, a scrappy, hustling player who squeezed value out of every position. If he can stand up to the .300 he hit last year, he'll be a key part of the infield. 3. Jose Alvarado: Last year, Alvarado lost almost as many games (six) as he saved (eight). But someone has to step up and be the team's closer. Alvarado is a possibility. 4. Brandon Lowe: Lowe has had a nice spring training with three home runs and a .391 average. On a team that lacks power, he could be an asset. 5. Yandy Diaz: Did the Rays get enough back in the Jake Bauers trade? It depends on Diaz, who hits the ball hard. But does he hit it often enough? It just blows my mind that nobody is talking about Cooper being at the end of his contract. It seems like a slam dunk that he would be extended but why hasn’t a deal be made before now? Money and length of the contract must be the sticking points. Could the new GM be a factor? I have to believe Yzerman would have had him signed to a new deal by now. Cooper is an attorney and a darn good hockey coach. What a combo that is. He knows what he’s worth. His value goes up with each Lightning win and if the Lighting wins the Cup, what a great position Cooper would be in then to demand a killer deal. Maybe there is something out there that intrigues him. If another team is willing to break the bank to get him he would be crazy not to cash in. Could he and Yzerman both end up in Detroit next year? That would make for quiet a story right? Maybe I worry too much but something is holding the 2 sides apart and until it’s over there is still a chance he doesn’t return. It’s happened before as we saw last year. 90% is pretty good but it’s not a done deal yet. I know that Stamkos came down to the end in his re-negotions, so perhaps Cooper will, too. I think more hasn’t been made of it because neither side talks about it. I don’t think there was a lot of conversation about Trotz jumping ship last March, either. I think you’re right; people just assume it’ll get done. And don’t worry about worrying. It’s what fans do.